limedragon :) » Blog Archive » Gusto! My yarn-buying binge did not stop at the 3 Kittens sale. Did you notice (perhaps with surprise) that I didn’t buy any sock yarn there? That’s right, I didn’t. There weren’t many left in the sale section, and nothing inside the store tickled my fancy. You see, last month, I suddenly had a craving for green sock yarn. It had to be a certain green. The dark green Fury I have in my stash from Shelridge Farms didn’t satisfy my craving because it’s so dark it appears black. I wanted something really green. What to do? Go sock yarn hunting, of course! 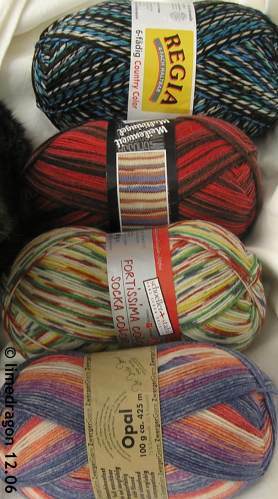 I browsed at Simply Sock Yarn Company, The Loopy Ewe, Blue Moon Fiber Arts, WEBS, and finally Astrid’s. There were a few things that came close, but weren’t exactly what I wanted. Along the way, I did cave and make a purchase at Astrid’s, and it recently arrived. Finally, after a few more days, I lucked out. I pounced on some Vesper Sock Yarn in Crew and Astro. Crew is the bottom skein�there it is, the greenness I wanted! Time for a happy sock yarn dance. 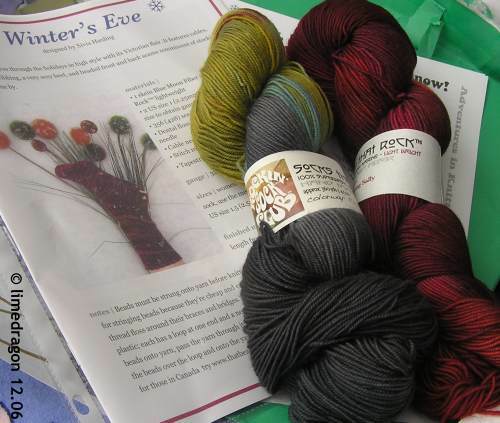 And just yesterday, the last 2006 shipment for the BMFA Rockin’ Sock Club arrived, with a very pretty Winter’s Eve pattern designed by Sivia Harding. That gorgeous red skein on the right is Mustang Sally and the left skein is a Rare Gem with mostly pea-green and gray. Hmmm…..and I thought my olive and orange “Rare Gems” was ah… interesting. The red is nice though, isn’t it? Oooh, that Vesper yarn is very yummy! Funny, I got my Socks that Rock, and I got the Mustang Sally, but not the Rare Gem. I can’t remember the name of the second skein, but it was very dark blue and red tones. Pretty. But definitely different! Love the photos! Great colours. Oh, so you’re the one that got that Vesper yarn!! I have tagged you for the “6 weird things about me” game. If you want to play…check out my blog for details. If not, no biggie — just thought it was fun!